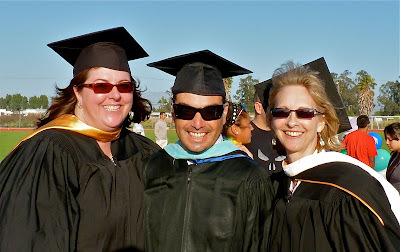 Yesterday was graduation at the community college where I teach. Have I mentioned I have the greatest job on earth? Our faculty always shows up at graduation to support our students and I have to say I choke up when some of those students pass over that stage to get their degrees. As an English teacher I get to know my students well, so it’s not just Jack or Rafael, or Eliza getting that degree. It’s Jack who started his full-time job loading trucks at 3:00am so he could get to my 10:30 Composition class on time. It’s Rafael whose parents are coming directly from their jobs in the strawberry fields to watch their first-born graduate from college. It’s Eliza who had a baby at 16 and decided to be more than just a statistic. Not all my students come from disadvantaged backgrounds, but these are the ones who tug at my heart year after year AND year after year I have to separate their pasts from their abilities and look at the grades in front of me. If they don’t have the skills to go on, I can’t pass them. It would be unfair to them and set them up for failure in the next class. Sometimes it’s heart-wrenching. Teaching is definitely not for wimps. A while ago, I did my annual repotting of my patio plants. Every year I look around and find the ones that need to move on to bigger containers. I pull them out of their smaller pots and see their roots are wound around each other and tangled. After the initial shock of transplantation, they soon flourish and bless my patio with greenery and blossoms. About a week ago, the wind knocked over one of my bigger plants that I had not repotted. The container was broken beyond repair. While I pulled it out, it I was shocked to see it too had roots that needed more room. I had overlooked it the first time around, but I could see clearly that it needed a bigger container if it was going to grow to its full potential. I guess you know by now where I am going with this. I see some of my students and know without a doubt they need the bigger container of a university and I also know that once they get there, and get over the shock of transplantation, they will absolutely flourish, blossom and make the world a better place. I look at the California University system right now, mired in budget woes, cutting enrollments, eliminating classes and worry that it won’t have the room for some of my students who are root bound. Then what happens? We have, through education, a chance to make our world a better place. We need provide the opportunity for growth, the chance to move into a bigger, more challenging environment for all students--including the ones who come from broken places. Or fester like a sore-- And then run? Even if, sadly, some of your students are not able to move into "bigger pots," you've helped them learn to use their skills and some tools, and they might still grow and flourish. Formal education is the outward and visible sign, but Life is also a great teacher. I have a lot of teachers in my life I know it is NEVER an 8-5 job. Kind of hard to tell for sure in the picture, but would those be your bird's nest earrings? I bet you got lots of cool comments on them. Teachers at my eyes always seems to have superpowers. What a blessing to see your "kids" graduate! I just saw my DIL graduate from college and we are so proud of her. She is now teaching 1st grade and loves it. But she said she had no idea how hard it would be! She is exhausted and happy! Thanks for being such a great teacher Betty!! Great post! Teachers rock more than anything in the world! Hardest job ever! birds nest earrings as your birds leave their nest... very appropriate. love that you love your job! Awww this is so uplifting and so full of hope and a little sadness too at the knowledge that there are so many many many more obstacles these students need to overcome to realise their potential! I wish them all well! And a big HOORRAAAY!! to you lovely teachers helping them along! And the earrings are fab!! Are those the bird nest earrings? Love them! It is refreshing to read about a teacher who loves her job - and obviously does an excellent job with her students. My younger daughter (she is 19) decided about a year ago that she wants to teach English. Wow, it seems like such a tough and rewarding job. I think you do the right thing about not just handing out the passing grades. Especially in this job-less economy. People need as much prep as they can get. Love the poem too. BTW...how's the rat in the wall? My husband and I are both teachers too. He is an English Professor at BYU, and I teach special ed kindergarten. Today is the last day for my little ones and I am so torn up about it. Thanks for your inspirational post! Ps. Do you have your students blog? My husband is getting the students more and more involved in digital communication. Beautiful post Betty - I love how you wove the story of your plants together with your story of your students each needing space and the chance to grow. When I was young growing up in the UK University was considered a right for all who had the ability to earn a place, and there were no fees and students who came from less well off families also got a grant. It's changed somewhat but still I think here in the US more needs to be done to assist those who have the ability to reach and grow but not the family background to get them where they should be. It's really the hardest job ever :) , Very nice post dear..
Hi Betty...I do believe what you do is the most important job in the world. Education is far more than gaining knowledge to use in some sort of job. It is the richest gift one can attain and the most important thing a parent can give their child. It stays with you a lifetime...one of the few things in life that does. you are right about certain students flourishing and needing more...but that is only a credit to what the amazing teachers provide the students...the wings to take the seeds they have been given and nourish them so they bloom into a self-sustaing garden. Thank you for helping to provide the world with better and more interesting people. So cool that you go to the graduation. I don't think I had a single college professor at mine. ah, what a great day and post. My one dream is to be asked to speak at a graduation...maybe next lifetime. Each student you mentioned got a bigger "Aaaw" and "wow". Such great warm and fuzzies, BB! I wish I had teachers like you when I was in college. You'd be worth it to work a job at 3:30 am and get to class for. Betty, it is so obvious that you are an Amazing teacher with a heart of Gold!!!! It takes someone who truely cares to see more than just a students name and id #. Teachers like You are the reason my sons, youngest son for sure, has succeeded and continue too! You must be an 'Angel' to so many whos live you touch and will continue to touch! :-) Thank you!! You were surely one "pot" that helped nurture the goodness, the kindness, the love, the care and the wisdom that was there in them. With that backing, they cannot go bad/rot even if the system doesn't support them BECAUSE you, good teacher, made fine individuals out of those fortunate few, lucky enough to be touched by you. I couldn't quite tell from the picture what your earrings were, but figured it out through the comments. Very symbolic. Nice touch. Now I'm just wondering what really does happen to a dream deferred. The earrings look great, Betty. Thanks for this. It makes me know that my heartbreak over my little buddy is universal. It does take a strong heart and spirit to be a teacher. I do believe that. Florida, too, is facing tremendous budget cuts in our universities. My daughter with a 5.0 GPA and so many activities and leadership positions that they all wouldn't fit on her college applications got deferred at first to the college of her choice. After an email expressing her desire to go to that college, she was accepted, but it does make me worried for the great majority of kids. There are more kids being denied than ever before and I wonder what will happen to these kids when there is no more room at the inn. Beautiful post, Betty. I love Langston Hughes. And you are so right about teaching. I look at my kids graduating and have the same hopes, dreams, and fears for them. love it, bb :) the only thing missing from that pic is ME! missed you guys :( this was my first graduation not sitting with you all. Yea, Betty! Wonderful to see kind, nurturing, caring teachers. Not all teachers are like that. Your writing is beautiful! I love the connections you make between your flowers and your life. Your students are lucky to have you. It must be wonderful to see your students on their big day. The world needs more teachers like you who actually care about the students they work with. Congratulations to each of the graduates and their extraordinary teachers as well. I want you as my teacher. The commute might be tough from CA to NY though. First, I love Betty's earrings. You do a wonderful thing and love it, to boot. A toast to you and your fellow teachers who work so hard to make things better for others. First, the earrings look great on you. Second, I love your passion for teaching and for your students. Third, I love that poem. Great choice. Congratulations to all of your students. Betty, is that young lady on the right really you? I definitely would've mistaken you for a student - young, gorgeous lady! I wrote an essay on that Langston Hughes poem, when I was in middle school. It's great to read it again. Great post ! Congratulations on getting to see your students walk ! I graduated last summer from a community college and my teacher who normally doesn't show up showed up for us. Great time ! You're such a caring and thoughtful teacher, Betty. It doesn't surprise me though! You 're very good in everything, as far as I know. You have a very noble profession and it`s clear that you give your best to your students. As the mom of one kid who just graduated and one who will do so at the end of the year, I thank you for being this kind of teacher. Very nice post. I love seeing how much you care for your students. Not all teachers are like that. What a great post! Those students are so lucky to have you! We need more teachers like you Betty! My brother became a teacher because "he'd be the smartest guy in the room, and he'd be able to hear his own voice all day...."